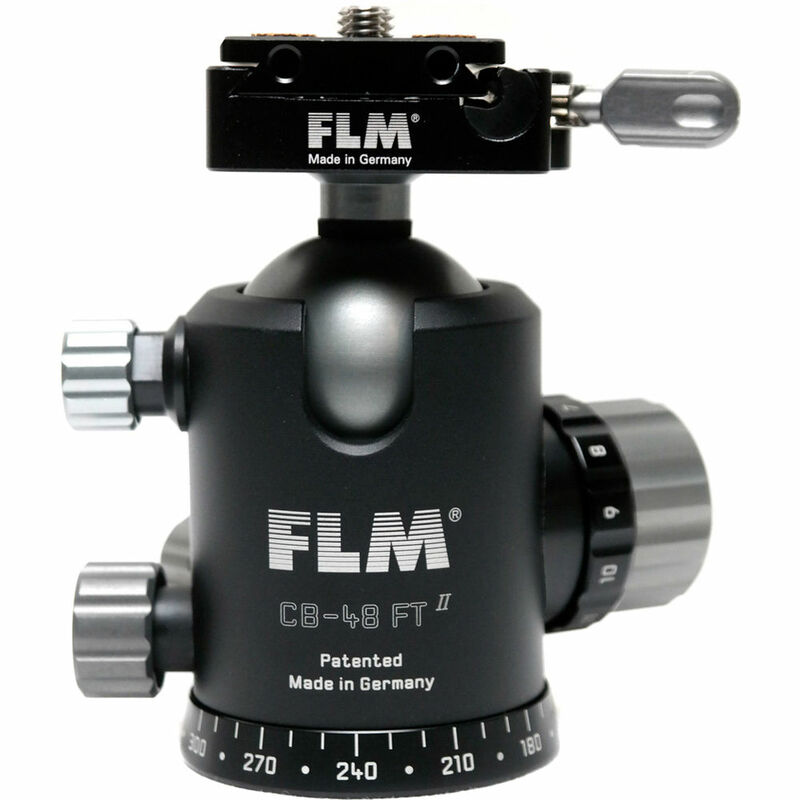 The CB-48 FTR Ball Head with QRP-70 Quick Release System from FLM is an aluminum alloy ball head that can support 99.2 lb. It has three locking knobs; one controls 360° panning and one controls the amount of friction and movement of the ball. The third knob controls FLM's patented tilt function. When the tilt function is activated, the ball moves along a straight line and acts as a tilt head. When the function is deactivated, you have full control over the movement of the ball in all directions. The quick release system includes a dovetail clamp and plate with laser engraved scale numbers on the side so you can adjust your camera fore and aft by 40mm. The plate clicks into the base from above and is secured by the locking pin so you can adjust the base and then lock it into place by turning the locking lever. This prevents your camera from sliding out of the clamp while you're adjusting the camera's location. All parts are sourced and manufactured in Germany. While panning, the PRS system locks your head every 15° and makes an audible click. A quick locking mechanism at 0° allows you to quickly attach or remove the head to or from your tripod. A notch in the head allows the camera to tilt 90° to shoot in portrait orientation. Box Dimensions (LxWxH) 5.1 x 4.6 x 3.8"
CB-48 FTR Ball Head with QRP-70 Quick Release System is rated 4.0 out of 5 by 2. Rated 5 out of 5 by Stu from Quality Ball Head Over the years I have tried a few different types of tripod and monopod heads. The FLM is bar far the best quality ball head I have used. It offers some great features such as a tilt lock which makes it easy to use on a monopod as well. The ratchet works well for your panorama pictures. The ball easily supports my 70-400mm G lens and the FLM release system is much more secure and safer than other systems I have used. Well worth the money. Rated 3 out of 5 by Timothy P. from Caution, QRP-70 Plate may not accept other brands Arca types This ball head is attractive, well made and offers precise control of tilt & pan functions. The arca style QRP-70 quick release base is equally well made and precise. However, I purchased Really Right Stuffs arca style BGE20-L, L-Plate with BG-E20 Battery Grip bracket for my EOS D5 Mk.IV. Surprisingly, the QPR-70 Quick Release base WILL NOT accept that L-plate!? In order to use my L-plate I was forced to buy the FLM SRB-60 arca style simple base and have the two plates switched out. 5 Stars for the CB-48 FTR ball head. 1 Star for the QRP-70 quick release base for being proprietary rather than true arca compatible. is this Arca Swiss compatable ? Can I use my AS plates? No, the QRB-70 Quick Release System used on the FLM CB-48 FTR Ball Head is not Arca-compatible.